TheDarkeowl: I Heart Makeup Lip Lava Molten Chocolate | Too Faced DUPE?! I have seen some of the Too faced products around and although I'm not a natural lipstick colour wearer, the darker colours did intrigue me and I was interested to find out how they looked! The product claims to contain Vitamin E and is supposed to be scented with chocolate. It says that vitamin E is supposed to be nourishing and although I don't find these lipsticks drying like some other liquid lipsticks, I wouldn't say that my lips were more nourished after wearing it! As for the chocolate scent, it is there, very slightly, but I wouldn't say it was full on chocolate scented which might be a good thing as it could be overpowering otherwise. I can't decide whether I like the packaging or not. It's a squeezy tube with a screw on lid. Inside the lid is a foam applicator and you squeeze the product through to apply it. I honestly find doe-foot applicators easier to use because I found that with this product, I kept having to squeeze more out, otherwise I would end out with a blob in one place and it was difficult to spread around. It has gotten a little easier since the foam has absorbed more product, but I still prefer doe-foots! The colour is really beautiful. I love this colour! Even though these are supposed to be brown shades, this shade definitely has a hint of purple in it, which makes it right up my street! Once spread out it is pretty opaque and you can build it up easily too! It does dry down but still stays pretty glossy and it does sometime feather throughout the day, but not so it looks disastrous! The Molten Chocolate does last quite well throughout the day. It only fades mainly when eating or drinking, it does transfer very easily on mugs etc, but overall it fades all over so doesn't look awful. You can top it up without it creating a strange texture and it doesn't feel strange on the lips after a period of time. It isn't a heavy product, but when it is first applied you can tell it is there. The Verdict? I do really enjoy using my I Heart Makeup lipstick, and I might look into getting some of their other colours, or some of their other formulas! It is pretty easy to apply and doesn't cause any hassle throughout the day. 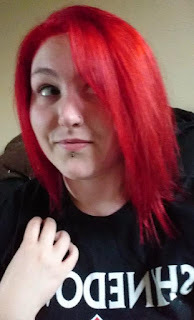 Although it might fade, it is no problem to reapply and I think the colour is brilliant! I would recommend this if you are in to more natural colours and don't mind having to check on the status of your lips every now and then; but I wouldn't recommend it for a night out at a restaurant or if you are planning on getting wasted (hands fly everywhere and this does NOT look good smeared up your cheek...)! Have you tried this lipstick? 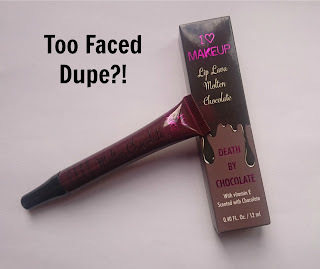 Do you think it is a dupe for the Too Faced product? Let me know!